Photo: Airbags save lives thanks to the selfless dedication of crash-test dummies, which have been a feature of car design since the very first dummy, Sierra Sam, made his original test drive in 1949. 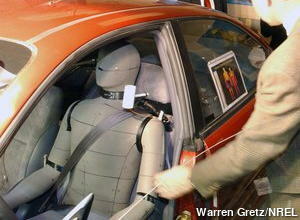 If we couldn't test new safety innovations with dummies, we'd never be able to deploy them in our cars for real. A typical crash-test dummy has over 130 different sensors packed inside. This dummy, whose name is "Adam," is even designed to sweat like a real person so researchers can test the climate conditions inside a car! Photo by Warren Gretz courtesy of US Department of Energy/National Renewable Energy Laboratory (DOE/ NREL). Like everything else in the world, car crashes are controlled by the laws of physics—and, more specifically, the laws of motion. Anything that moves has mass (very loosely speaking, this means how much "stuff" an object contains and it's closely related to how heavy it feels) and velocity (loosely, this is the same thing as speed, but strictly it means speed in a certain direction). 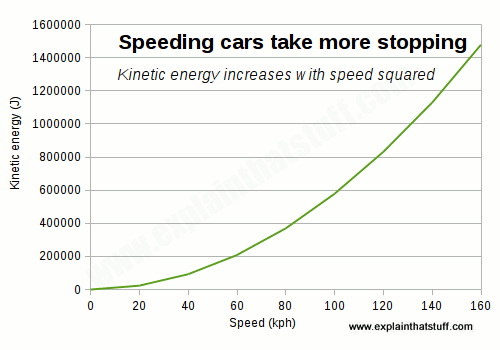 Anything that has mass and velocity has kinetic energy, and the heavier your car and the faster you're going, the more kinetic energy it has. That's fine until you suddenly want to stop—or until you crash into something. Then all the energy has to go somewhere. Even though cars are designed to crumple up and absorb impacts, their energy still poses a major risk to the driver and passengers. The trouble is, people inside a moving car have mass and velocity too and, even if the car stops, they'll tend to keep on going. It's a basic law of physics (known as Newton's first law of motion, after brilliant English physicist Sir Isaac Newton who first stated it) that things that are moving tend to keep on moving until something (a force of some kind) stops them. Cars have had seatbelts for decades, but they're a fairly crude form of protection. The biggest problem is that they restrain only your body. Your head weighs a surprising 3–6kg (6–12lb)—as much as several bags of sugar— and isn't restrained at all. So even if your body is fastened tight, the same basic law of physics says your head will keep on going and smash into the steering wheel or the glass windshield (windscreen). That's where airbags come in. Airbags sound like they must be a good idea, but scientists like hard evidence: is there any proof that they reduce fatalities? In 1995, Adrian Lund and Susan Ferguson published a major study of road traffic accidents over eight years from 1985 to 1993. They found that airbags reduced fatalities by 23–24 percent in head-on crashes and by 16 percent in crashes of all kinds, compared to cars fitted only with manual safety belts. That's obviously a huge improvement, but it's important to note that airbags are violently explosive things that present dangers of their own. The biggest risk is to young children, though adults also face a small risk of eye injury and hearing loss. If an airbag saves your life, you probably consider a slight risk of injury a price well worth paying. Even so, it's clearly important to study the potential dangers of airbags so we can make them as safe and effective as possible. Modern airbags (installed since the late 1990s) fire with less force than older designs, and there's compelling evidence that this has reduced accidental deaths, especially among children, without compromising passenger safety. When a car hits something, it starts to decelerate (lose speed) very rapidly. Artwork: John Hetrick's original airbag design from 1953, which I've colored to make it easier to follow. There are three separate drawings here, showing the main mechanism (occupying most of the picture), a driver's perspective view of the steering wheel (bottom right), and a view of the inflated bag from the side (top right). The bag is triggered by a heavy weight (blue) restrained by a spring (yellow) inside the red cylinder on the right. After an impact, the weight pushes the spring to the right, opening a valve inside a pipe (turquoise) that allows compressed air to flow out from a cylinder (green) and inflate the airbag cushion. Artwork courtesy of US Patent and Trademark Office. Read a full description in Safety cushion assembly for automotive vehicles (via Google Patents). If you search around online, you'll find quite a few different people are credited with inventing airbags. Who thought of them first? It appears to have been John W. Hetrick of Newport, Pennsylvania, who came up with the idea after an accident in which he swerved his car off the road into a ditch to avoid hitting a rock, almost throwing his daughter through the windshield. 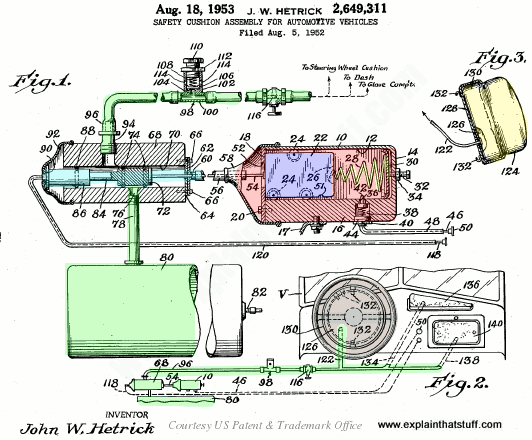 Hetrick filed his patent for a Safety cushion assembly for automotive vehicles on August 5, 1952 (it was granted as US Patent #2,649,311 on August 18, 1953). Although a German inventor named Walter Linderer filed an airbag patent several months before Hetrick, it was granted after Hetrick's, and it seems likely that the two men came up with the same idea independently. 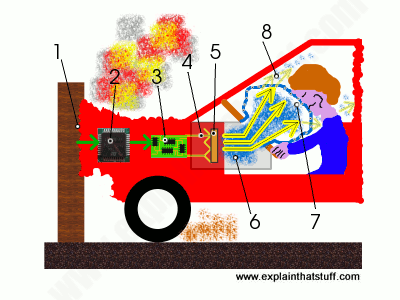 Many other inventors have built on the idea since then, notably Allen K. Breed (1927–2000), who developed a variety of different ways of triggering the explosion of gas inside an airbag just before the impact of a crash. According to Breed's New York Times obituary, he made his first airbag design in 1968, and filed numerous patents for improvements, helping to turn Breed Corporation into one of the world's largest suppliers of car safety systems. A Cheaper Airbag, and Takata's Road to a Deadly Crisis by Hiroko Tabuchi. The New York Times, August 26, 2016. How a controversial airbag redesign plunged major auto makers into a safety crisis. Takata's Faulty Airbags Still Exact Toll as Recalls Lag by Hiroko Tabuchi and Danielle Ivory. The New York Times, January 30, 2016. Could a huge recall of cars with Takata airbags undermine confidence in the technology? People's airbag 'prevents injury': BBC News, 24 September 2008. How a personal airbag could protect you from injuries when you fall over. External airbag protects pedestrians by Ben Mack, Wired, 5 April 2009. Engineers at Cranfield University have developed an airbag that inflates on the outside of a car. Car airbags can cause deafness? by Tim Radford, The Guardian, 19 February 1999. Low-speed airbag deployments could cause brief, high-intensity pressure waves that damage your hearing, one expert argues. Mobility Without Mayhem: Safety, Cars, and Citizenship by Jeremy Packer. Duke University Press, 2008. How do we square ideas like safety and caution with a car culture that thrives on freedom and speed? Packer explores contradictions like this in a fascinating historical account. Crash by Nicholas Faith. Channel 4 TV/Boxtree Books, 1998. Why do we resist improvements in car safety so strenuously? Risk by John Adams. Routledge, 1995/2000. A fascinating study of how our perception of risk makes us act more safely or dangerously. There's no specific coverage of airbags, but the effectiveness of seat belts, cycle helmets, and similar safety measures is discussed at length. Car Science by Richard Hammond. Dorling Kindersley, 2007. A cunning book about science heavily disguised as a book about cars! A great way to learn about the science that makes cars work. If you're interested, I worked as a consultant and contributor on this book. Ages 9–12. Eyewitness Car by Richard Sutton. Dorling Kindersley, 2005. One of the many excellent DK Eyewitness books, this one teaches you about the history and technology of cars from early days to the present. Again, most suitable for ages 9–12 though older readers (and even adults) will probably enjoy it too. Airbag Deployment in Slow Motion: A side-on view of what happens when an airbag inflates, by Biodynamics Engineering, Inc. Note how the bag automatically deflates at the end, albeit more slowly than it would with a person pressing against it. Ford Next-Generation Airbag Crash Tests: Slow-motion crash-test dummy footage showing how airbags inflate at incredibly high speed during a crash. US Patent #2,649,311: Safety cushion assembly for automotive vehicles by John W. Hetrick, August 18, 1953. US Patent #4,711,466: Method and apparatus for gas generator initiation from external sensor by Allen K. Breed, December 8, 1987. Google Patents has many more of Allen Breed's inventions on record—and most relate to car safety.